Getting to Ucluelet or Victoria is easier than you might think! Along with some of the best salmon fishing in the world, we are easy to get to and have less boat traffic than many “remote” fly-in resorts. Unlike some of the “remote” resorts, that may have five other lodges within a short distance and up to a hundred boats fishing the same small area, in Ucluelet you can enjoy small town hospitality and uncrowded fishing grounds. There are three airports on Vancouver Island within a scenic 3 hour drive* to Ucluelet. Rental cars are available at all airports listed below. For our Alberta guests, WestJet offers direct flights from Calgary and Edmonton to Comox, BC. East Coast guests may want to fly into Vancouver International Airport before connecting to one of the airports listed above. Commuter flights from Vancouver to Tofino (the closest airport to Ucluelet) are available through KD Air. United Airlines offers direct flights from San Francisco to Victoria, BC. From there you have three choices. BC Ferries offers service from the mainland (Vancouver) to Vancouver Island at two points: the Horseshoe Bay Terminal in North Vancouver and the Tsawwassen Terminal, south of Vancouver. 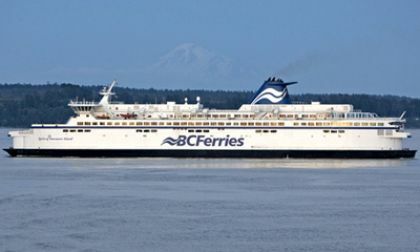 Ferry service from Horseshoe Bay arrives at Departure Bay Nanaimo, whereas service from Tsawwassen arrives in Swartz Bay near Victoria, or at Duke Point, south Nanaimo. Nanaimo is closest to Ucluelet. You can find detailed driving directions to BC Ferry terminals on their website. For more information or to make a reservation, visit BC Ferries: www.bcferries.com, 1-888-769-3766. *See the Vancouver Island airports listed above. All airports have car rentals available. This is the closest you can fly to Ucluelet. KD Air offers flights directly from Vancouver to Tofino, and Ucluelet is a short drive away (aprox. 30 min.). From the #1 Hwy in Vancouver – take the Horseshoe Bay ferry out of North Vancouver. This will take you to Departure Bay, in Nanaimo. Take Exit 60 onto Highway 4 also known as the Pacific Rim Highway (travelling west) for 156 km (97 miles). At Port Alberni continue going straight down the hill, and turn right at the T-junction. From there, follow Pacific Rim Highway. From the US you can travel through Port Angeles and take the ferry to Victoria, or you can drive across the USA/Canada border to Tsawwassen (South of Vancouver) and take the ferry to Duke Point (south of Nanaimo). Here are some approx driving times to Tofino or Ucluelet including the ferry ride, border wait, and waiting for the ferries. During July and August the border wait can be around 30-45 minutes. If you drive through Port Angeles the border waits are much less. Head north from Nanaimo Ferries, Nanaimo Airport, Victoria Airport or south from Comox Airport. Once you get to Qualicum, exit and take Hwy 4 to Port Alberni. Go through Port Alberni and take a right at the T intersection. After about an hour you will come to another T intersection. You can go right to Tofino or left to Ucluelet. From the #1 Hwy in Vancouver – take the Tsawwassen ferry out of South Vancouver. This will take you to Swartz Bay, in Sidney, 30 mins from Victoria. Glanford merges with Carey Rd and almost immediately after turn rt onto Tilicum Rd. Follow Tillicum for 1.8 km when it will merge onto transfer st and then onto Lampson. Follow Lampson for 800 meters (.5 mile) and you will turn left on to Old Esquimalt and immediately right onto Head St. Follow Head to the water and you will see a large parking lot at 453 Head. Scott will meet you with a parking pass. We fish Victoria during winter months.